Jesus calls Levi, a tax collector, to follow him. Levi leaves everything and does as Jesus asks. When Levi gives a party in Jesus’ honour, the Pharisees complain about Jesus. What does he think he is doing, mixing with such people? Jesus is clear in his answer. He is there for those who need him, no matter who they are. He calls those who are traditionally outcast, on the margins of society. He wants people to start anew and follow him. Sometimes it can be easier to consider ourselves virtuous and to pick holes in the actions of others. But we all have our own failings. Do you have moments when you are like the Pharisees in this text, grumbling about the flaws of others? Or are you like Levi, prepared to repent for your mistakes and to try again? This Lent we can make a fresh start, and try to be the people that Christ calls us to be. We too can reach out to those on the margins, those who are left behind. And through our actions, others may have the chance to reach their full potential and live a dignified life. Christ Jesus, you call us all to follow you. Strengthen me so that I might turn and follow you, reaching out to others with love. Amen. Can you make a fresh start? 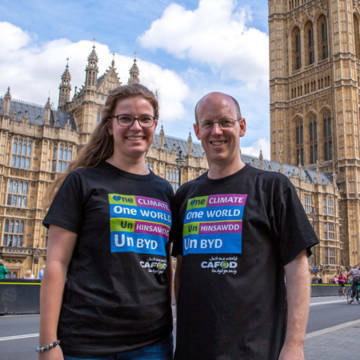 As one small step, sign up to campaign with CAFOD. We can all make a difference by speaking out, living differently and taking action. Your voice counts.